Santa Letter Writing. From paper and stickers to stamps and stencils, we provide all the eco-friendly materials so kids can create their letters for Santa and mail it to the North Pole. The ‘Not A Box’ Contest. A childhood idea of transforming a brown box into a TV set was the impetus for the JTB product box and the installation at the JTB Pop-Up Store. Show us your ingenuity. Transform a simple brown box into the invention of your choice, explain it and enter to win a $150 Jade’s ToyBox gift card. Holiday StoryTime, By Kids, For Kids. Bring the kiddos in for holiday story time and hear special guest kid ‘authors’ share an excerpt of their favorite prose too. Check JTB Blog for Schedule and Sign-Up. Holiday Craft Workshop. 2 p.m. Using recycled and found objects, we’ll transform simple items into beautiful holiday gifts for family and friends with a little help from our in-store staff and visitng artists. Organic Gingerbread Cookie Workshop with ButterBeans. 11:30 a.m.
Join ButterBeans for homemade organic gingerbread cookie decorating and hot cocoa fun! Holiday Cookie Swap with MiniMunchers. 2 p.m.
Join MiniMunchers for an organic twist on cookie making! They’ll teach the kiddos how to make healthy, yummy homemade cookies for a holiday cookie swap. The Sock Monkey Workshop. 2 p.m. Bring in your non-stinky, recycled socks and let’s put them to good re-use as a great holiday gift. We will have classic sock-monkey socks for sale on-site too. Holiday Craft: Musical Instrument Workshop. 2 p.m. Using recycled and found objects, we’ll transform simple items into awesome musical instruments that make great holiday gifts for family and friends. Holiday StoryTime, By Kids, For Kids. 2 p.m. Bring your kiddos in for holiday story time and hear special guest kid ‘authors’ share an excerpt of their favorite prose too. Studiotime with Hudson Soundlab. Sign-Up fast to record your original music, poem or book reading. Makes great gifts for family & friends. By appointment. Several packages are available until Dec 12. 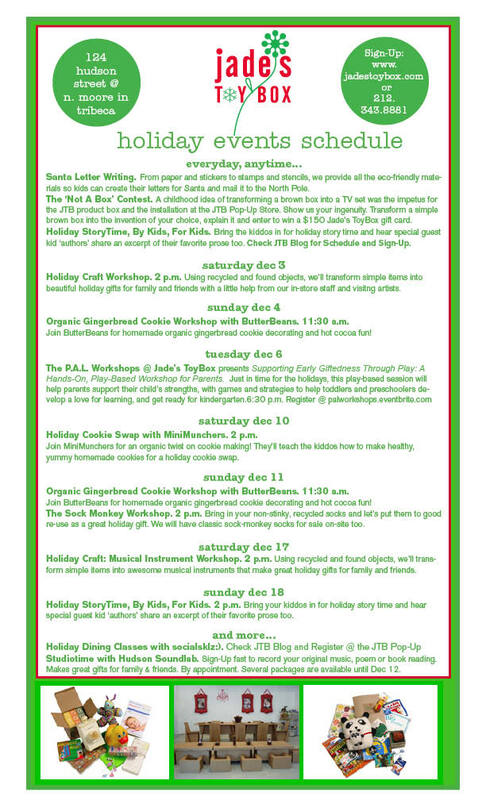 Sign-Up at the JTB Holiday Pop-Up Store or call 212.343.8881 to guarantee a spot for our great line-up of holiday fun. Hours: Monday and Friday from 9 am-7pm, Tuesday through Wednesday and Saturdays from 11 am -7 pm, and Sundays from 11 am-5 pm. This entry was posted on November 30, 2011 at 3:37 pm and is filed under ACTIVITIES FOR KIDS, EVENTS, HOLIDAYS, P.A.L. Workshop Series, PRESCHOOLER, TODDLER, Uncategorized. You can follow any responses to this entry through the RSS 2.0 feed. You can leave a response, or trackback from your own site.